Cinnamon bark(Dalchini, Kalmi Taj) is used as a spice obtained from the inner bark of trees from the genus Cinnamomum that is used in both sweet and savoury foods. It is principally employed in cookery as a condiment and flavouring material. In India it is used in curries and garam masala. Cinnamon is a spice obtained from the inner bark of several trees from the genus Cinnamomum that is used in both sweet and savoury foods. Cinnamon has a long history both as a spice and as a medicine. In India cinnamon bark also know as Dalchini, Kalmi Taj. There are two main types of cinnamon, Ceylon cinnamon and Cassia cinnamon or Chinese cinnamon. Cinnamon ceylon often considered to be "true cinnamon", Cassia cinnamon originates from southern China, is typically less expensive than Ceylon cinnamon. 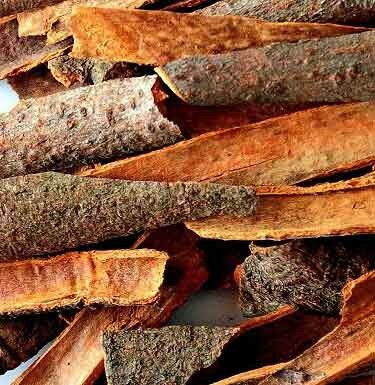 Cinnamon bark or sticks (Dalchini, Kalmi Taj) is regarded as the second most popular spice, next to black pepper, in the United States and Europe. The flavour of cinnamon is quite delicate and aromatic, and is thus used more in dessert dishes. It is commonly used in cakes and other baked goods, milk and rice puddings, chocolate dishes and fruit desserts, particularly apples and pears. Modern research indicates that cinnamon may have some beneficial health properties. Cinnamon is packed with nutrients, including carbohydrates, sugar, soluble and insoluble fiber, calcium, sodium, vitamins, minerals, fatty acids, amino acids, essential oils and more. Buy Dalchini, Kalmi Taj (Cinnamon Bark) online at best price from KiranaPlace, a online spice store in India. Dalchini, Kalmi Taj can helps to keep diabetes under check. Cinnamon bark has great digestive properties, it helps with weight loss. Cinnamon bark helps relieve cold and cough. Cinnamon's scent boosts brain function. Cinnamon helps to improve colon health and protect against heart disease. Cinnamon's essential oils also qualify it as an "anti-microbial" food.